Colour is a bright ruby and the aromas feature strawberries and raspberries. It is medium bodied, smooth and juicy. Light fruit flavours much in evidence as is a lively acidity, a little spice and an excellent fruity finish. Very Highly Recommended and great value too. Winemaker Claude Serra employs, among other things, low yields and “a ruthless approach to quality control” to ensure a wine that reflects the variety and its terroir. 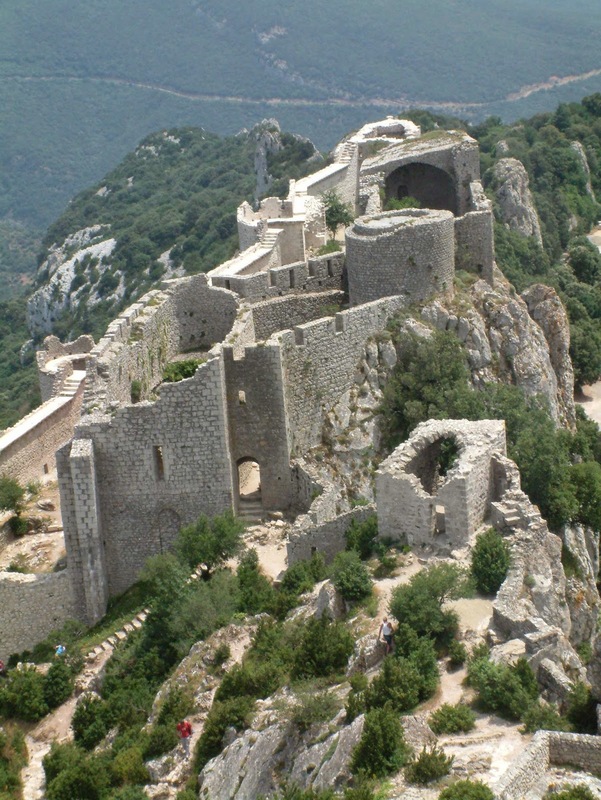 And that terroir is in the Ardeche region of western Provence. The fact that it’s a cool-ish area helps the Pinot Noir. By the way, if you ever have the good luck to be in the area, try the clafoutis! And try everything else as well. All with a glass or two of this Pinot, a very good food wine. Bon Appetit! 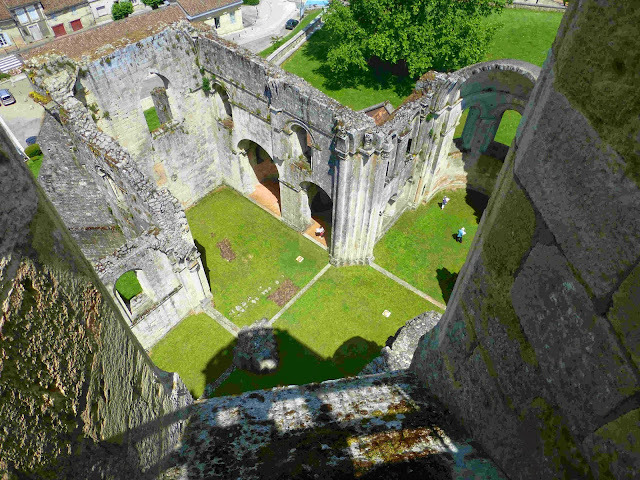 La Serre is the name of the limestone hill which overlooks the village of Fraïssé des Corbières. The wine is blended from the fruit of old vines grown on a limestone influenced terroir : Grenache Blanc (50%), Grenache Gris (35%), Terret Bourret (15%). Under the hot Midi sun, the vineyard produces delicious ripe fruit to make this organic dry white wine. Colour is a mid straw and you’ll note lots of micro-bubbles hanging around in the glass. It has an aromatic nose with hints of honey. Citrus fruit flavours and a striking minerality share the spotlight on the palate. Lively acidity too and a long lip-smacking finish with the aromatics lasting the pace too. Very Highly Recommended. 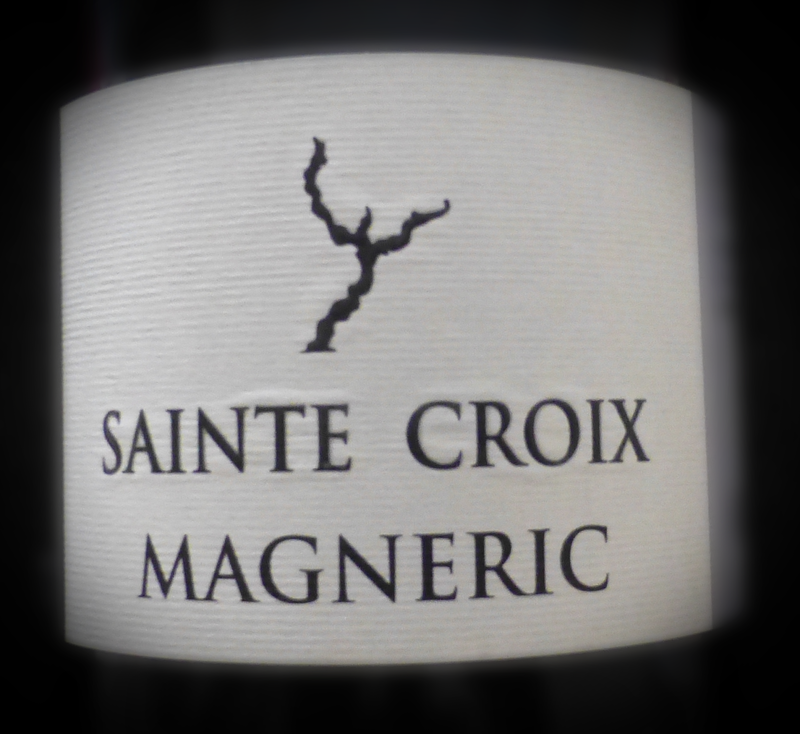 Like most Southern Rhone wines, this is a blend, mainly Grenache plus Syrah, Cinsault and Mourvedre. And it is made by a man whose philosophy is summed up by this sentence: I will not use the power of death (herbicides, pesticides, other -ides) but I will use the power of life. And, from the dry hot Provencal climate (2,800 hours of sunshine each year), this dark ruby wine is full of life. Aromas of ripe red fruits, mainly strawberry, hints of kirsch. And magnificent fruit flavours feature prominently on the palate, well-balanced though. Chapoutier is always worth following, right to a very satisfying finalé in this case. No hesitation here: Very Highly Recommended. 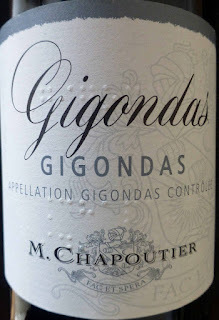 The VHR was always on the cards here as both Chapoutier, “the Poet of the Rhone” and Gigondas are among my favourites. For more on this fascinating winemaker check here. Love Red? Three of the Best. Fruit, spice, and power feature in this well-balanced blend of Carignan (42%), Grenache (29) and Syrah (29). The vineyard, run by an English couple, Jon and Elizabeth Bowen, has been organic since 2008 and they recommend pairing it with anything from Spiced lamb tagine to Roast venison. This is a dark, medium to full bodied, wine with ripe dark fruit aromas to match. That fruit, spice too, on the palate, concentrated, with outstanding freshness, tannins soft and ripe and no slacking off in the long aromatic finalé. Power and elegance in the one package and Very Highly Recommended. We had another beauty from the same vineyard a month or so back. Check out Le Fournas here. Il Grigio da San Felice Gran Selezione Chianti Classico (DOCG) 2013, 13.5%, €34.95 (27.95 in recent sale) O’Brien’s Wines. Made from “our finest Sangiovese (80%), enriched with other ancient indigenous varieties”, the result is a superbly complex wine of great elegance and concentration. Just 40,000 bottles are produced of this particular wine which has an ageing potential of 15 years. It has been aged for 24 months in mixed oak plus 8 months in bottle. Sangiovese, also known as Brunello and Bonarda, is a top red grape in Italy. Tuscany is its home but it is grown all over Italy, also in the US, Australia and Argentina. 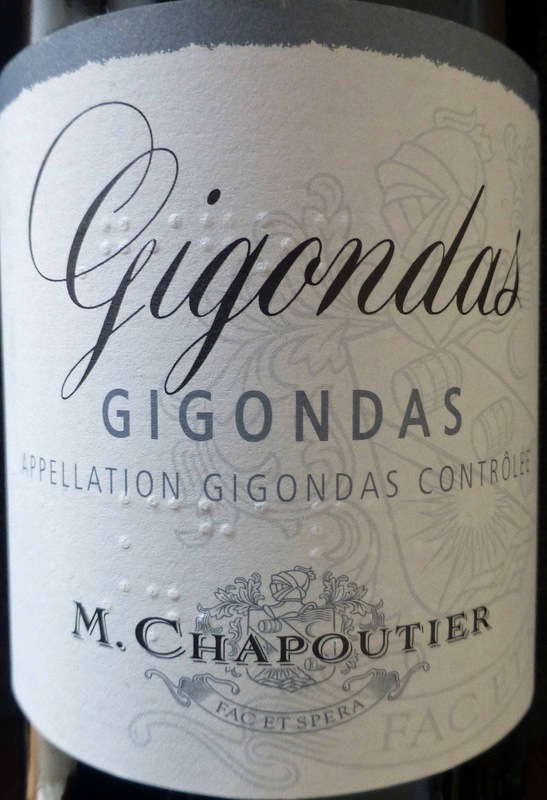 Colour is medium red and the aromas feature ripe red fruit (strawberries, cherries). There is terrific concentration in this medium-bodied gem, spice too and a superb acidity to balance and it boasts a long dry and spicy finish. Very Highly Recommended. Matches suggested are red meat, pasta and pizza. You could also do as I did and try it with cheese. I had Carrigaline, both the original and the smoked, and all got on very well together! 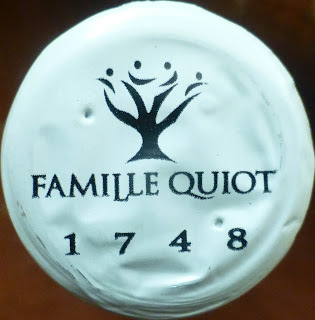 The family Quiot began their wine story in the Vaucluse when they acquired a few hectares there in 1748, so the nod to tradition is to be expected. 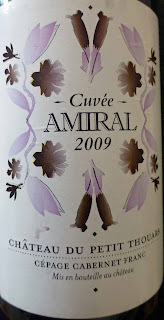 This wine is made from the traditional grapes of Grenache, Syrah, Mourvedre and old vines of Carignan. 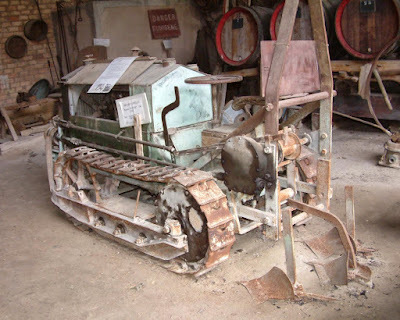 Old style vinification too in tanks and oak barrels. Colour is a lovely ruby and there are raspberry and cherry in the aromas. On the palate, it is fruity for sure, spice also, a very good depth of flavour, nicely balanced; the tannins are close to smooth in this medium bodied wine and there is an excellent finish as well. It packs quite a punch for such a smooth wine and is Very Highly Recommended. That noticeable acidity helps make it a good food wine, lamb, roasted meat and cheeses are recommend by the producers. I found it a terrific match with Moussaka, especially the version made using this recent recipe from Dublin's Tang Restaurant in association with Glenisk - see the details here. This purple beauty is a blend of organic fruit: Carignan 50%, Grenache 21%, Syrah 19%, and Mourvèdre 10%, grown near the ruins of a 19th century lime furnace in the Garrigue scrub. Wild yeast and minimal pumping (to keep the fruit quality as intact as possible) are used. Ageing is 100% sur lies in tank for 18 months. Aromas are of rich red and darker fruits. Superb delicious fruit flavours (including cassis and plum) and impressive concentration on the palate, a fresh acidity, soft tannins and some spice all contribute and what follows is an equally impressive finish. Very Highly Recommended and a wine to try again in a few years time. They suggest pairing it with the cuisine of the Mediterranean region using tomato-based sauces, olives or wild herbs such as thyme or rosemary. The concentration of fruit and acidity balances rich sauces and particularly ‘red’ poultry/game such as pigeon, duck or guinea fowl. 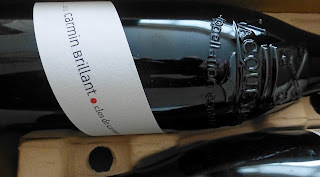 From the vineyards of the Golden Stones, a village in Beaujolais north of Lyon, comes this wonderful and gorgeous wine. The Côte de Brouilly is one of the ten crus of Beaujolais and, yes, Brun’s Gamay grows on the granite that the grape thrives on. Jean-Paul is in the minority of French winemakers that use natural yeasts. 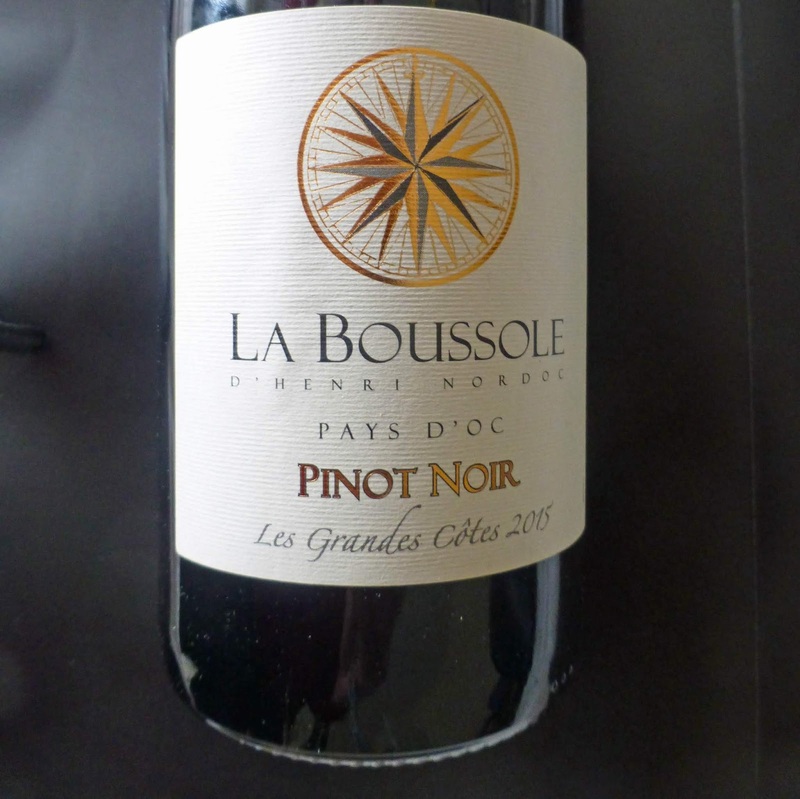 Colour is an attractive light red with a bunch of red and black berries in the aromas. The palate too is ripe, with a brisk and balancing acidity, lovely and soft and elegant to the end. Wonderful and refined and light on its feet, this cru is Very Highly Recommended. I’ve been lucky this year to have had enjoyed some lovely Beaujolais and this is another one. I have a small assortment of Riedel glasses but enjoy this and similar wines from the much less expensive Lumen Arc globes that I won in a raffle in L’Atitude 51. April, the Real Wine Month, is up and running! Real Wine Month is an exciting, innovative promotion of artisan wines which have been produced sustainably by organic, biodynamic viticulture and low intervention (a.k.a. 'natural') winemaking. It is being run across Ireland and the United Kingdom by specialist importers Le Caveau (Ireland) and Les Caves de Pyrène (United Kingdom). From 4th-30th April, selected wines will be poured by the glass or featured on wine lists, in tastings and themed events in over 200 restaurants, independent retailers and wine clubs across the U.K. and over 50 in Ireland. This, the third Real Wine Month in Ireland, is shaping up to be the best yet. From pubs, bars and bistros to Michelin-starred establishments, to independent retailers and wine clubs, we have seen increasing interest in the quality, authenticity and diversity of these small-scale, artisanal wines. Through participating restaurants and retailers, the promotion represents a great opportunity for wine-drinkers to taste and explore a diversity of wines that are not mass-distributed due to small-scale production, or indeed are in short supply due to global demand particularly from cities like New York, San Francisco, London and Paris. To see what’s on in your area, the events, the participating restaurants, wine bars and stores, please click here for the full press release. I hope to have another post or two over the month. In the meantime, here are some of the wines that you may well come across. There are some real beauties here! I didn't know it then but I was looking down on this vineyard less than two years ago. After a visit to Gavin Quinney’s Chateau Bauduc, I had climbed to the top of the famous local abbey Le Sauve Majeure and, from the final 159th step, had a great view over the surrounding countryside. April is Real Wine Month and, as part of the fun, Chateau Turcaud will be represented at events in Dublin and Cork. 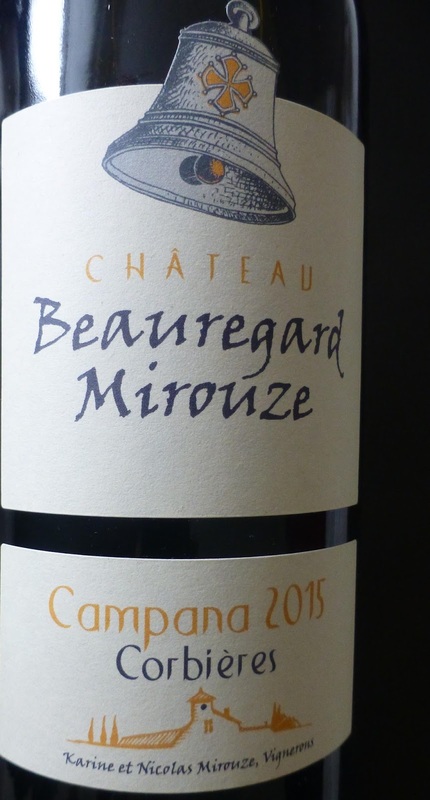 This particular wine is a classic Bordeaux blend of Sauvignon Blanc (60%), Semillon (35%) and Muscadelle (5%) and, having been fermented and aged on the lees in vat, the result is very crisp and fruity. 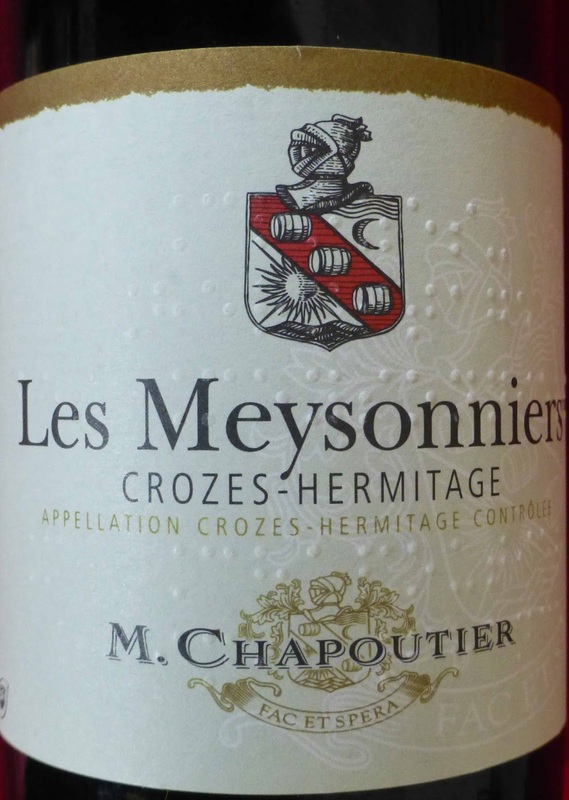 You'll note a good depth of yellow in the colour with aromas of citrus fruits, some blossoms too. On the palate, it is more intense, more assertive than the nose, with a lovely wave of fruit flavours, an excellent mouthfeel, well balanced and with a good finish. Highly Recommended. Serve this delightful wine well-chilled as an aperitif, with all sorts of seafood, or with goat cheese, sheep cheese, and hard cheeses. Isabelle and Stéphane Le May are eager to safeguard the local soil and terroir they have inherited: they’ve come back to mechanically weeding, and fight vine diseases with sustainable methods. 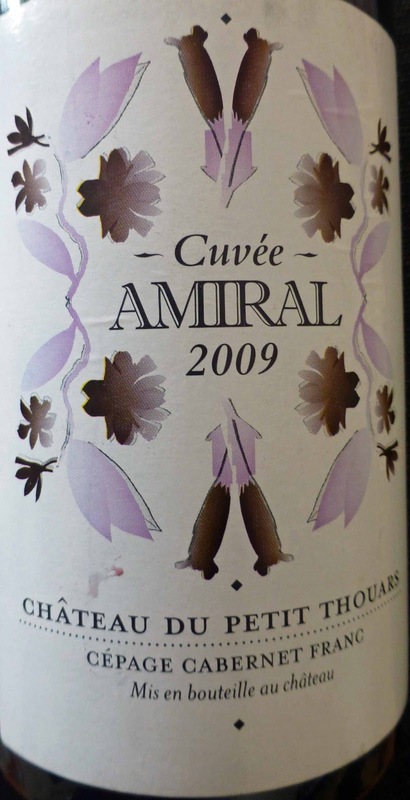 Winemakers Karine and Nicolas Mirouze have blended 50% Grenache and 50% Syrah (over 40 years old) to make this excellent organic wine. Mirouze will be another of the French wineries to be represented here this month. Their favourite pairing for this wine is Duck breast accompanied by a ratatouille of vegetables from the garden. Colour is a deep red, almost purple. The aromas, savoury and spicy, puzzled me a bit and the chateau says they are “nose dashing”! A mingling of the scents of red fruit and garrigue (the local scrub). So there you are. On the palate, you find intense dark fruit flavours, spice too, tannins noticeably in play, yet overall invigorating and with a very good finish. A really warming satisfying wine and Highly Recommended. 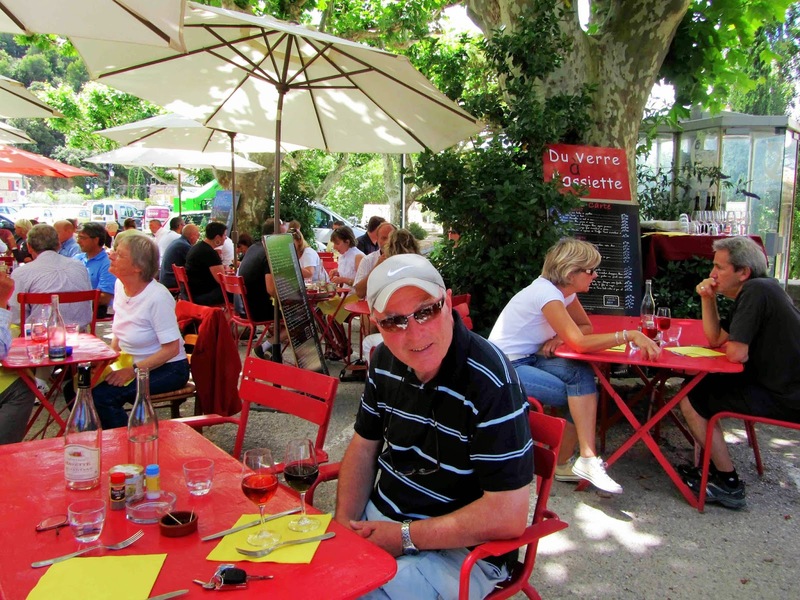 Vacqueyras village, under the shade of its large trees, stays cool when the vineyards all around are warm. And this is one cool wine, coming from a height of 200m, higher than most of its neighbours. The vineyard is naturally isolated by a belt of Mediterranean forest, making it ideally suited for organic viticulture, for which the domain obtained full certification in 1989. Most of the work in the vineyard is carried out by hand and the yields are very limited. Clos de Caveau too are coming to Dublin and Cork in April. Colour is a dark red and the aromas feature red fruit and some hints of herbs. 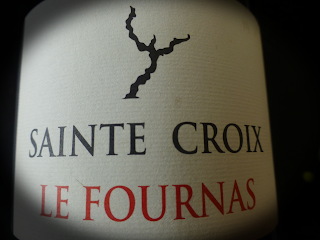 It is very smooth and concentrated on the palate, lush fruit flavours with spice and herbs, and fine tannins. An excellent finish as well and Very Highly Recommended. The blend is 60% Grenache, 40% Syrah and it is 100% organic. The aromas are intense and very pleasing, one that invited me to take off my glasses! Like the wine, I’m getting on; by lifting the glasses, my nose works that little bit better! It is quite a dark red with a lighter rim - it is after all getting on in years! On the palate, it is very very smooth and rounded, gentle too, nothing extreme, still fresh but ready to enjoy and appreciate, with an excelling lingering finish. Very Highly Recommended. 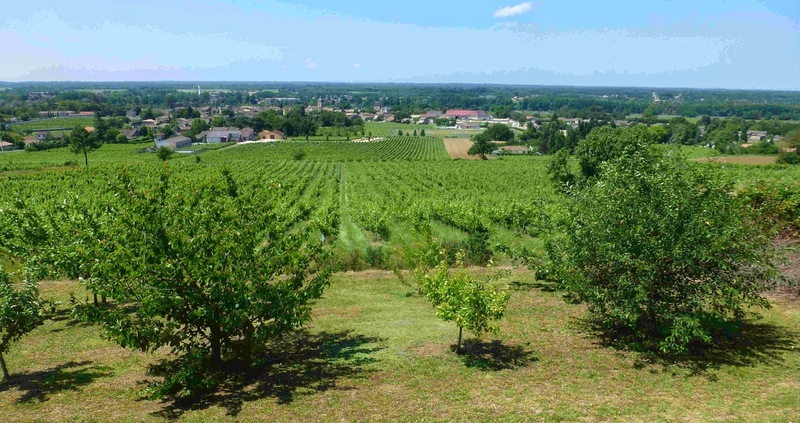 Bergerac, perpetually in the shadow of neighbour Bordeaux, produces many excellent wines, mainly from much the same grapes. This blend of Merlot (45%), Malbec (35%), Cabernet Sauvignon (15%) and Cabernet Franc (5%), is an excellent example. By the way, the proportions of the blend vary from year to year. It spent eight months in oak. Viticulture is biodynamic. A word from the makers: This wine, quite powerful in the mouth, will accompany venison, duck, the stews and cheese. It will be better if decanted for within hours, and can be kept between 5 and 8 years. The eight years is up! But no panic at all. Languedoc Strongholds: Corbieres, Minervois, St Chinian. Top Notch Reds. And White! 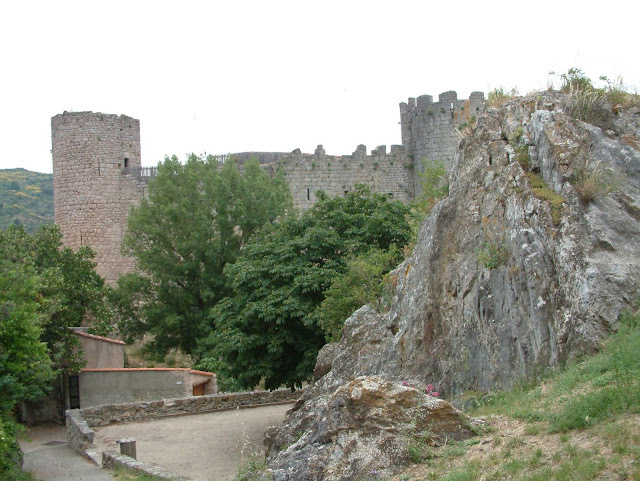 “Down here, they speak the language differently”, I had mentioned to my companion as we came down from Peyrepertuse (left), a high Cathar fort in the Languedoc, south of Carcassonne. Workmen stopped to allow the string of tourists reach the car park. The digger-driver was instantly on his mobile and soon he illustrated my language point as one “Whay” after another boomed out. No gentle “Oui” for him! They make wine differently too in the rocky hills of the western Languedoc. And they make it very well indeed. Le Moulin des Nonnes, Cuvée Inés blanc 2012, Minervois, 13.5%, €12.00 in SuperValu French Wine sale from 12th Feb.
Les Secrets Saint Chinian rouge 2012, 13.5%, €10.00 in SuperValu French Wine sale. This red, a brilliant blend of Grenache and Syrah, is Very Highly Recommended. There is a superb introduction on the palate, excellent fruit, spice galore, but nothing extreme, all well balanced. Quite an elegant medium-bodied performer with a silky smooth lingering finish. St Laurent Corbieres rouge 2012, 14%, €10.00 in SuperValu French Wine sale. The palate on our second red is slightly more reserved and none the worse for that, fruit and spice again in evidence but slightly more rounded. The Corbieres, bottled by the same co-op in Saint Chinian, is more full bodied, possibly a bit better as a food wine. Grilled meats and cheese are recommended. 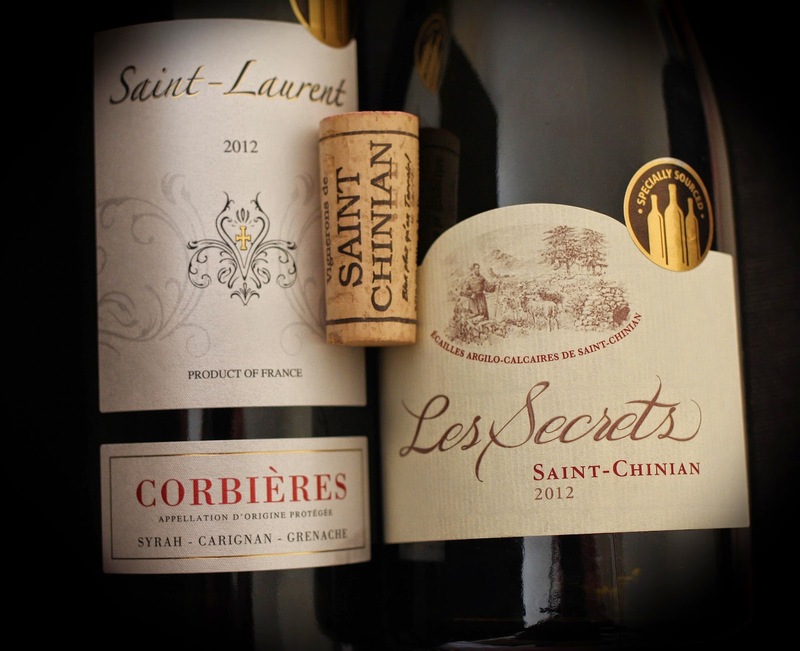 Indeed, I think the Corbieres is marginally the better wine but I have a small preference for the Saint Chinian. Both though are Very Highly Recommended. * French wines are extremely popular in SuperValu and all three above are part of their French sale that begins on February 12th. 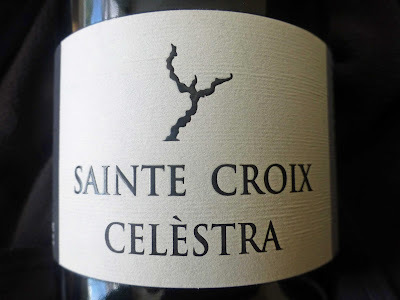 These three would be a good start and I also note that the Minervois blanc is part of a trio that may be had for €25.00, the others being Coteaux de Giennois (Loire Sauvignon blanc) and Domaine Cristia Grenache. There is more from the Languedoc and big name areas, such as Bordeaux and the Rhone, are also well represented.